Record Number Of Native Americans Running For Office In Midterms Deb Haaland could be the first Native American woman to head to Congress. She's one of a record number of Native American candidates running for office this year. Deb Haaland worked on President Obama's 2008 campaign before chairing New Mexico's Democratic Party. Now she's running for office with a record number of other Native Americans across the country. On a recent afternoon in Albuquerque, N.M., Deb Haaland sits with a thick stack of paper in front of her, calling donors to thank them for their contributions and to ask them for more money. 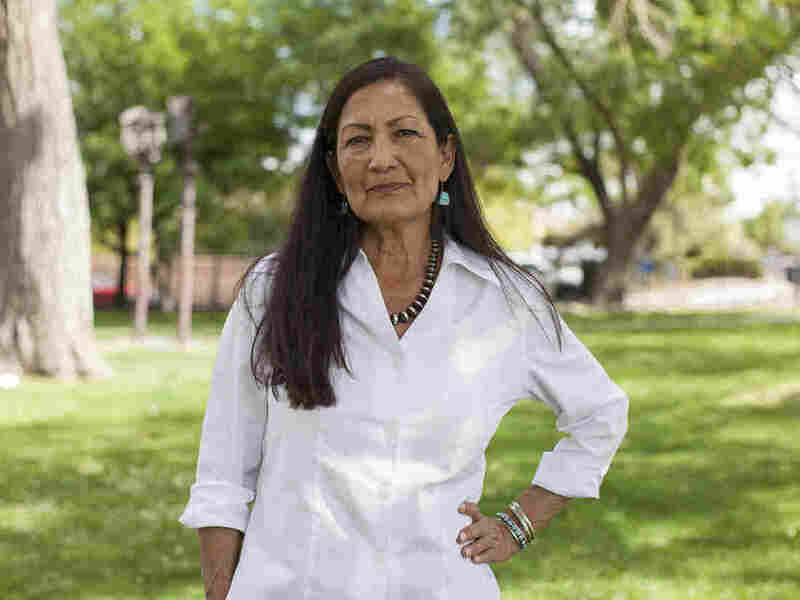 After winning her Democratic primary, Haaland, a member of the Pueblo of Laguna, a Native American tribe, is running for the U.S. House in a strongly Democratic district in New Mexico. That means she may soon be the first Native American woman in Congress. "Somebody has to be the first," she says as she walks through the southeast neighborhood where her office is. "Native women, I mean we've been on the frontlines for a long, long time. Think of all the native women who have fought for treaty rights and fishing rights and all of those things." Haaland worked on President Obama's 2008 campaign before chairing the state's Democratic Party. But after thinking a woman would become president in 2016 and feeling let down, she says she decided to run for federal office. Because she says, she understands what it is to be working class in the United States. "I identified with so much of what people go through in this district and in the state. Half of our population is Medicaid eligible," she says. "I know what it's like to be on food stamps. My daughter and I both are paying off our student loans. So, I just felt like I know what it's like and we need more people who know what it's like to struggle." Haaland is a single mom, went to 13 different public schools in the district where she's on the ballot and says she understands Indian country. "We have a president who doesn't understand what the trust responsibility is to tribes or our history at all." She says that's a major reason why she's running for Congress. "You want to have influence over people who are making decisions for one of the most vulnerable communities in our country." She's one of a record number of Native American women running for office this year — a record number of women among a record number of Native American candidates. This year, Haaland says, is the year of women of color. "This year, maybe we just all said separately, 'It's time for us to take the next step.' "
Then there's Peggy Flanagan, a state representative in Minnesota now running for lieutenant governor. Her top campaign issues include access to child care, education and inequities affecting "children of color and Indigenous students." But also, she says, it's an opportunity to educate people about Native Americans and to stop legislation that's done to her community, rather than alongside it. "Minneapolis is the birthplace of the American Indian movement and we have incredible history as well as infrastructure," she says. "Oftentimes, it's just ignorance ... That we weren't given these rights. We always had them. Educating folks on issues of sovereignty." There's also Paulette Jordan, making a Democratic bid for governor in the conservative state of Idaho. She grew up on a reservation in a rural part of the state. "We need leadership that will help defend the voices of the people and the needs of our community. There is no other option but to lead. That's why I'm running for governor," she says. "Balance in the voices of representation in government is wholly unique and very critical." Even without big wins in the fall for these candidates, the sheer number matters says Mark Trahant. He's the editor of the news site Indian Country Today. He's been keeping track of Native American candidates for the last six years. "There really is a record year this year. It's extraordinary," Trahant says. "You see folks running for such a variety of offices." There are two Native American men in Congress now - both Republicans — and Trahant expects as many as ten Native Americans will be on the congressional ballot this fall. He says that's double the number in 2016. In Oklahoma, there is a race between two Native American candidates, one a Democrat and the other a Republican. As for statewide offices, there are more Native Americans running for lieutenant governor alone, six candidates, than the number who ran for statewide offices across the country in 2016. Trahant says some of this is a reaction to the current political climate, but it's also the fruit of years of work by Native American organizers, advocates and politicians. And the candidates, he says, especially the women, are dismantling stereotypes with campaigns that show the diversity of Indian country. Tatewin Means, a candidate who recently lost a primary for attorney general in South Dakota, had a groundbreaking political ad because it was in Lakota. Trahant says is the first time he's seen a political ad in a native language. There's also Sharice Davids, an ex-MMA fighter and lesbian who's running for Congress in Kansas. She wears a t-shirt that reads, "Strong, Indigenous, Resilient" as she pounds a punching bag. In the ad, she says "It's 2018, and women, Native Americans, gay people, the unemployed and the underemployed have to fight like hell just to survive." Trahant says this ad and others are changing things. "What's important about these ads is they will change people's perceptions about Native Americans in general, not just the political campaigns, but how people perceive the native community," he says. It's also galvanizing Indigenous voters who he says are often sidelined by voting laws and distrustful of a government that has taken so much from them. That's clear when walking around with Deb Haaland in Albuquerque. Many different kinds of people, Native Americans and more, walk up to congratulate her on her primary win. At a recent minor league baseball game, Robert Piper greets her. "As a native Hawaiian, I'm very proud of you," he tells Haaland, shaking her hand. Even though he can't vote in New Mexico, he says when one Native American rises "it lifts all First Nations people." As Haaland leaves the field, an employee grabs her hand, holds it and says "From one Native American sister to another, congratulations." Back at the office, one of Haaland's interns, Dechellie Gray, gets emotional as she explains why she's working on the campaign. "I see my family in her family and I think that's something that's really important that I've never seen before." She's Navajo. Her voice trails off and she pauses to hold back tears. "It's just very emotional for me because it means so much," she says. Gray says she's never seen anyone who she looks like run for federal office. New Mexico is about 10 percent Native American. "I just think that it's really important that a government represents the people that live in their districts," Gray says. "Deb always tells the story of her grandparents being sent to boarding school. And my great grandparents experienced The Long Walk. She knows what that's like. And I don't think that a lot of politicians see that and have first-hand experience of that." There's a lot of energy around this year's crop of candidates but getting voters out is another issue. Historically, Indigenous voters have had some of the lowest turnout rates of any group in the country.